How to tell if your child is ready for violin lessons! Approximately two days ago, an old friend of mine reconnected with me, asking if I thought that her five year old girl might be ready for violin lessons. After giving her my advice, it occurred to me that there must be many parents out there who are in the same boat! This post will hopefully help you to decide if your son or daughter is ready for private violin lessons yet. Please remember that you may apply these principles to any instrument. What about older children? It is never too late to start. Older children benefit from the fact that they feel a sense of control over the situation, often having chosen the instrument themselves. Older children, while often and usually having to catch up technically, also have the ability to move at a faster pace compared to their younger counterparts. The Suzuki Method stresses the importance of daily practice at home with heavy parental involvement. This works great for some children but not for others. Parenting is a delicate balancing act. On the one hand, we parents want our children to be exposed to a number of wonderful things that the world has to offer. On the other hand, we often want our children to naturally want what we want. A child who, one day, finds the violin highly exciting, might get bored after the "honeymoon phase" when he or she realizes that there is a need to practice regularly. Yet, particularly if this child is talented, after a certain age (possibly around 10) the child might need his or her parents to teach the concept of sticking with a commitment, even when things get tough. I have seen students go through a rough patch where parents have stuck with the lessons and they have come out on the other side completely self-motivated. It can happen! Perhaps Most Important - Does your child naturally gravitate toward music? Most children are naturally musical. 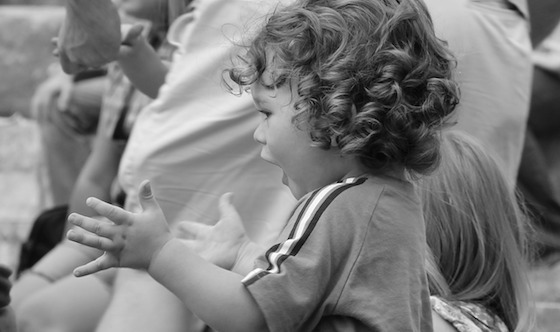 In fact, studies have shown that even very young babies respond to rhythm. As a child gets older, I believe that he or she will gravitate to the music that is most often played in his or her domain. In other words, if you as a parent listen to any type of music at home, your child will take it in by osmosis. Of course every child, like every adult, develops his or her own particular favorites. I strongly encourage parents of young children to nurture this aspect and, when old enough, teach your child how to play his or her favorite songs on a CD player just for him or her. As a child of the 80's, I had my own vinyl record player designed specifically for children. To this day, I remember the fascination I had playing record after record. In addition to hearing my parents play piano at home and my mother sing nursery rhymes, this was one of my first experiences of music education once I reached the age of awareness. Have questions or something to add? I'd love to read your comments below! December 19, 2015 at 12:29 AM · The accompanying picture of the curly-haired child with left hand fingers spread, shows an ideal beginning violinist's hand because of the wide stretch between the pinky finger and its neighbor. That was my hand before age 4, when I began lessons. I never stopped until graduation from Conservatory, having lessons and enjoying my violin, Now as a senior citizen I had a wonderful life with music. Please consider taking a look at your child's hands, before age 4!